Mute, Wax Trax!, Nothing, Brainwashed, Thirsty Ear, Planet Mu, Tino Corp.
Meat Beat Manifesto, often shortened as Meat Beat, Manifesto or MBM, is an electronic music group originally consisting of Jack Dangers and Jonny Stephens, and formed in 1987 in Swindon, United Kingdom. The band, fronted by Dangers (the only permanent member), has proven versatile over the years, experimenting with techno, dubstep, drum and bass, IDM, industrial, dub and jazz fusion while touring the world and influencing major acts such as Nine Inch Nails, The Chemical Brothers and The Prodigy. Some of the band's earlier work has been credited with influencing the rise of the trip hop, big beat, and drum and bass genres. Dangers and Stephens had formed the English pop group Perennial Divide in 1986 with Paul Freeguard and released the first few Meat Beat Manifesto singles as a side project. They left Perennial Divide in 1988 to record a full Meat Beat album. The tapes of what would have been the debut MBM album were claimed to have been destroyed in a studio fire before it could be released (detailed in a publicity statement). The former founder of Sweat Box Records (Rob Deacon) said that the fire never happened. Jack Dangers confirmed the story of the fire in a 2010 interview. The pair then recorded the LP Storm The Studio, which got them pigeonholed as an industrial act because Sweat Box Records sold the rights to the LP to Wax Trax Records for release in the United States. In response, they released 99%, which was more techno-influenced, in May 1990. In August they released Armed Audio Warfare, which was an effort to re-create the lost tracks of the would-be début album. The band's live show was conceived as an intense audio-visual experience, with dancers, led by choreographer Marcus Adams, in costumes and sets designed by artist Craig Morrison and video clips accompanying live instruments, sequenced electronic instruments, and live DJing. In the United States, they opened for Nine Inch Nails on their debut national tour in 1990. In 1991, they performed at The Limelight in Manhattan. Despite his contributions being nonmusical in nature, Adams was credited as a full band member and appeared in many of the band's record sleeves and promo photos until the release of Satyricon in 1992. Adams also appeared in several of MBM's early videos, such as "Strapdown" and "Psyche-Out". 1992's Satyricon continued to show Meat Beat adopting a more mainstream electronic sound, crediting influences of such newly popular dance bands as Orbital, The Shamen, and The Orb, all of whom had either remixed or been remixed by MBM. The album produced the hits "Mindstream" and "Circles". "Original Control (Version 2)", renamed "I Am Electro" in later compilations, is the best-known track from the album, featuring samples of recordings from the 1939 World's Fair exhibit Elektro The Robot, and was the opening song in MBM's 2005–2006 tour. In 1993 Dangers relocated from England to San Francisco, resulting in Stephens' departure from the band. At this time, Nothing Records was founded as an imprint of Interscope with the purpose of signing industrial and electronic bands to capitalize on the recent success of Nine Inch Nails. Nothing, helmed by Trent Reznor, signed Meat Beat Manifesto and in 1996 the double album Subliminal Sandwich was released. While this album represented MBM's major-label debut, it failed to achieve the critical and commercial successes of previous releases. After Subliminal Sandwich, Dangers put together an album called Original Fire that collected various studio rarities, B-sides, and fan favorites from the early years of MBM, in addition to some new remixes of the material. Also in 1996, the group contributed to the AIDS benefit album Offbeat: A Red Hot Soundtrip produced by the Red Hot Organization. In 1997 Dangers recruited drummer Lynn Farmer and multi-instrumentalist John Wilson (MBM member 1995-1998 former Supreme Love Gods) to record and release Actual Sounds + Voices in 1998, which found the group's earlier flirtations with jazz fusion featured more prominently; the record included appearances by saxophonist Bennie Maupin. The album yielded the single "Prime Audio Soup" which was featured in the film The Matrix. While Jon Wilson left the band prior to the 1998–1999 tour, Farmer remains with the band as of Spring 2007. Wilson was replaced by former Consolidated programmer Mark Pistel, who also remains a contributing member. During these years, Dangers contributed a pair of remixes to high-profile Nine Inch Nails releases Closer to God and The Perfect Drug. After the release of Actual Sounds + Voices, Meat Beat Manifesto was let go by Nothing Records and once more appeared on independent labels. In 2000, Dangers released a 12" MBM EP of four new songs called Eccentric Objects which demonstrated a shift in Dangers' output towards simpler song structure and less sonically-dense layering. This evolution in form was full realized two years later, in 2002, with the release of Meat Beat Manifesto's seventh full-length album, RUOK?. This album prominently featured Dangers' newly acquired EMS Synthi 100, as well as guest contributions from turntablist Z-Trip and The Orb's Alex Paterson. In 2003 MBM released a remix album for Storm The Studio, followed by ...In Dub, a remix album of RUOK?. At the Center was released on 29 May 2005. A part of independent label Thirsty Ear's Blue Series, the album is a collaboration between Jack Dangers and jazz musicians Peter Gordon (flute), Dave King (drums), and Craig Taborn (keyboards). While Dangers had, in the past, flirted with jazz instrumentation and sampling on a handful of Meat Beat Manifesto tracks, At the Center was a marked variation of the expected MBM sound and was more of a one-off experiment than a whole new direction for the band. The album has been well received by many critics, with one reviewer calling it "one of the best albums of the year in any genre." An EP of outtakes, live tracks and a remix titled Off-Centre was released shortly after. From 2005 through 2006, MBM launched a worldwide tour, their first since 1999, making use of video sampling technology that allowed the band to trigger video clips in real-time, on two large screens positioned stage front, while the band performed either side-stage or behind the screens, out of the audience's view; instead, live video footage of the band performing was displayed onscreen alongside the pre-assembled clips. Many of the video clips used were the sources of samples previously used in various MBM tracks, such as footage of Elektro the Robot and clips from films such as Head and Dark Star. Dangers and crew performed a wide variety of hits and fan favorites from the entire back catalog, though relatively little of the new jazz fusion material from At the Center was played. In 2006, Meat Beat Manifesto's "Suicide" was released on the Underworld: Evolution soundtrack and is the only MBM track to date to prominently feature a guitar. In May 2007 Dangers released a double CD titled Archive Things 1982-88 / Purged. The first disc contained many early Meat Beat Manifesto experimentations, including demos of what would later become seminal MBM tracks such as "I Got the Fear". The second disc was an instrumental version of the Perennial Divide album, Purge. MBM's ninth studio album, Autoimmune, was released on 7 April 2008 in Europe via Planet Mu Records and on 8 April 2008 in the US and Canada via Metropolis Records. The album featured the first vocals by Dangers himself since 1998's Actual Sounds + Voices, as well as collaborations with DJ Z-Trip, MC Azeem, and Kenneth James Gibson. The album has been described as a return to an older, harder MBM sound and as a dubstep album, though Dangers has stated that he prefers not to fall into any specific genre or category with his work. The lead single, "Guns And Lovers" was released as a digital single via iTunes on 18 March 2008, while the track "Lonely Soldier" was released as a single via bleep.com. 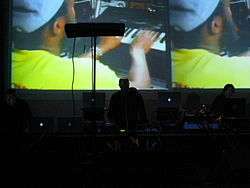 Meat Beat Manifesto once more toured to support the new album with the same stage setup as the 2005–2006 tour. Meat Beat Manifesto most recently released the album Answers Come in Dreams in late 2010. Meat Beat Manifesto have put out albums and singles, and participated in remixes and compilation albums. Atomic Babies "Cetch Da' Monkey"
Boom Boom Satellites "4 a Moment of Silence"
Banco De Gaia "How Much Reality Can You Take"
Nine Inch Nails "Closer (Deviation)"
Nine Inch Nails "The Perfect Drug"
Solypsis "Perpetually Out Of Control"
The Shamen "Ebeneezer Goode", "Hyperreal"
Tower of Power "What Is Hip"
Twilight Circus Dub Sound System "Highway"
↑ "Meat Beat Manifesto Poster". Web.archive.org. Archived from the original on 27 October 2009. Retrieved 27 August 2014. ↑ "Thirsty Ear Recordings". Thirstyear.com. Retrieved 27 August 2014. 1 2 3 Zipf, Jen (6 February 2009). "Meat Beat Manifesto interview". Prefix Magazine. Retrieved 7 April 2009. ↑ Bush, John. "allmusic Meat Beat Manifesto Biography". Allmusic Guide. Retrieved 14 October 2009. ↑ "Craig Morrison Design > About". 2008. Retrieved 14 October 2009. ↑ "An Amazing Drug Like Quietus". 2010. Retrieved 21 December 2010. ↑ "Meat Beat Manifesto — New York — Limelight — 02 July 1991". Songkick. 2 July 1991. Retrieved 27 August 2014. ↑ Peter Watrous (4 July 1991). "Pop in Review - New York Times". Nytimes.com. Retrieved 27 August 2014. ↑ "Meat Beat Manifesto Biography". Artist Direct. Retrieved 2 May 2009. ↑ "Jack Dangers: The Mind of Meat Beat Manifesto". Allaboutjazz.com. Retrieved 27 August 2014. ↑ "Meat Beat Manifesto :: Off-Centre (Thirsty Ear, CD)". Igloo Magazine. 11 May 2005. Retrieved 7 February 2010. ↑ Thill, Scott (7 April 2008). "Autoimmune review/Jack Dangers interview". Wired. Retrieved 2 May 2009. ↑ "MBM News". Brainwashed. 21 May 2007. Retrieved 2 May 2009. ↑ "Meat Beat Manifesto returns with 'Autoimmune' on Metropolis Records". Side-Line. 11 April 2008. ↑ Cook, Jason (29 November 2010). "Meat Beat Manifesto. Answers Come In Dreams.". The Quietus. Retrieved 22 June 2012.